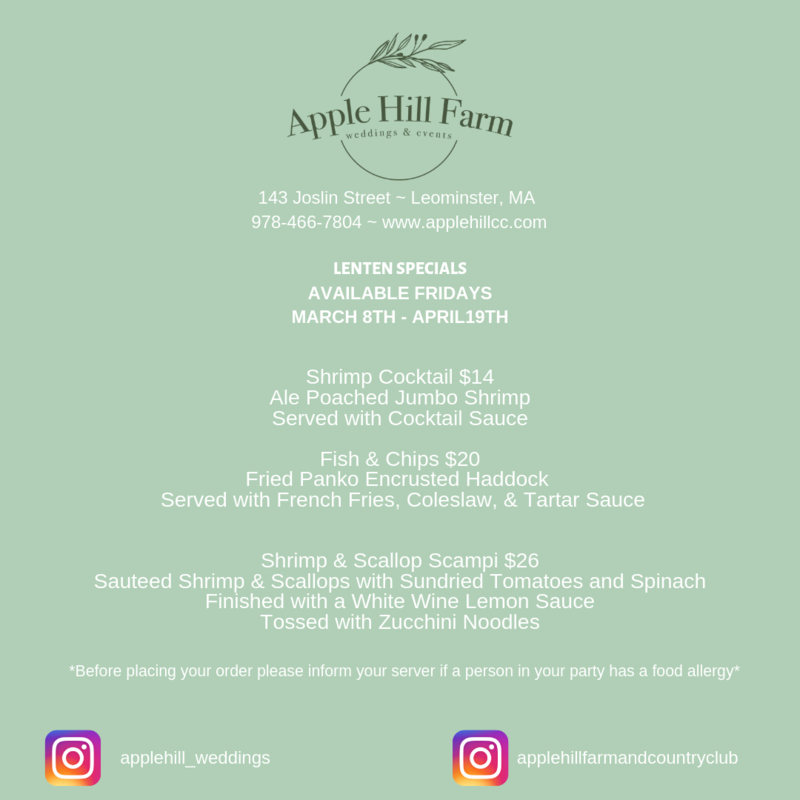 Apple Hill Farm & Country Club often referred to as A Hidden Gem in Central Massachusetts, is a premier venue for wedding ceremonies & receptions, corporate events, & social events. It sits upon the crest of Joslin Street (Bigelow Hill) and boasts panoramic views from its 35+ Acre Farmland & Orchards overlooking rolling hills & fields. Located in Leominster, Massachusetts and only minutes away from Route 2, it is easily accessible from all areas of Massachusetts & New England. Apple Hill Farm & Country Club boasts multiple venue spaces to accommodate groups from 10 to 200 guests. The professional event team will work with closely with you during the entire planning process create an unforgettable event tailored to your needs. 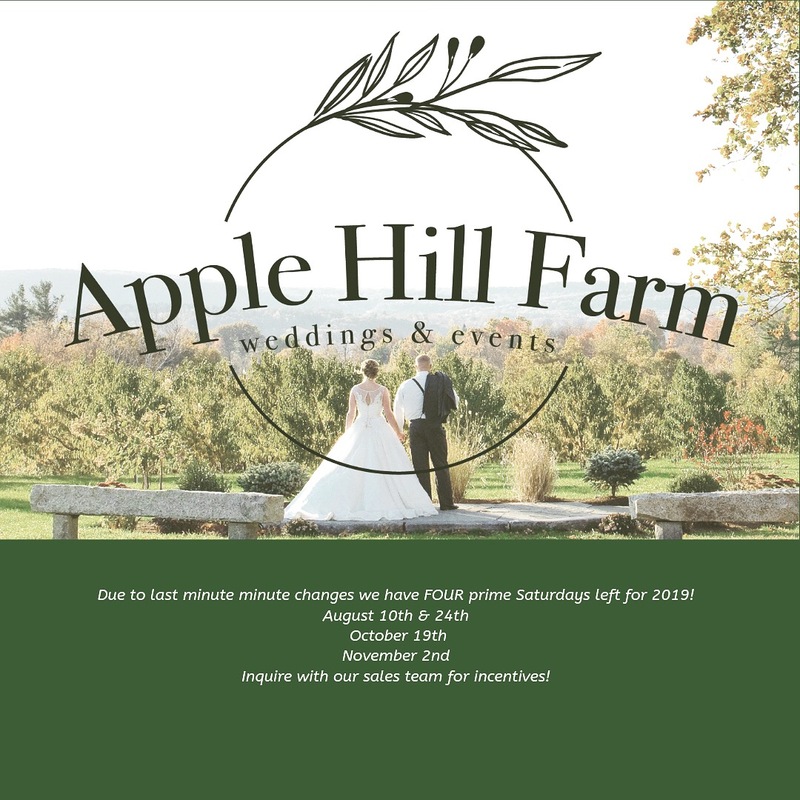 Whatever the occasion may be let Apple Hill Farm & Country Club be your destination! The parlor can accommodate events up to 97 guests with expanded seating weather depending on the screened in porch. This room was the original barn storefront that has been renovated to keep the quintessential New England charm, complete with a working stone fireplace & rustic decor. The adjoining screened in porch can hold up to 40 guests with breathtaking views of the neighboring rollings hills and farms. The spaces are booked together offering our clients the best of both worlds. The Ballroom is a new addition to the existing barn and was built in 2012. offering an event space to accommodate up to 200 guests, The ballroom is a formal and elegant space featuring stunning chandeliers, mahogany wood paneled walls with hand painted textured ivory walls, & a built in dance floor. In addition to a timeless wedding reception venue, it is the perfect location for a holiday party, birthday party, large bridal or baby shower, corporate meetings, and larger social gatherings. The Conservatory is a semi private room adjacent to the Library Bar & Restaurant, with a wall of windows overlooking the fields and a westward view, it is the perfect setting for an intimate dinner party or corporate meeting. It can host events up to 30 guests. The space can also be booked in conjunction with the Library Bar & Restaurant Area for larger groups. When not booked for a private event guests can enjoy dinner with views of the fields through the wall of windows. The Library Bar & Restaurant is open Wednesday – Saturday for dinner 5pm-9pm, The Library Bar & Restaurant area is available to host cocktail hours for afternoon weddings, daytime events seven days a week & evening events on Sunday Monday & Tuesdays (It can be closed for private events during regular restaurant hours for an additional fee). Interested in exclusive use of the property and venue, just ask one of our event team members!